The supremely relaxing Macdonald Pittodrie House Hotel stands in its own 2,400 acre estate some six miles from Inverurie and less than 20 miles from the centre of Aberdeen. The estate gives scope for gardens and activities, and extends to the summit of Bennachie, the iconic hill which dominates this part of Aberdeenshire. You can read our dining review for Macdonald Pittodrie House here. The location of the site of a Pictish fort on Mither Tap, the shoulder of Bennachie overlooking the rear of Pittodrie House, and the presence of the magnificent Maiden Stone, a Pictish symbol stone, beside the road half a mile north east of the hotel, show that the area had high status residents from an early date. In the early 1300s King Robert the Bruce granted the lands here to the Erskine family, and they built a castle know as Maiden Castle nearby. Pittodrie House was built by the Erskines as an L-plan tower house in about 1480 after Maiden Castle had been destroyed by fire, and over the following four centuries a series of updates and changes were made to the structure, with utterly charming results. Shipping magnate George Smith brought the house in 1896, and his grandson Theo Smith opened it as a hotel in 1977. A major extension to the rear of the existing house was built in 1989, in a style which complements the older parts of the building beautifully: and with 16 additional guest rooms on the upper floors and the ballroom suite on the ground floor. 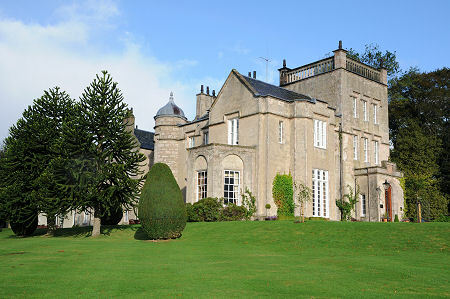 Pittodrie House is now part of the Macdonald stable of hotels. The fine front door, surmounted by an Erskine family crest, leads you into the hotel's reception. Off to your left is the drawing room, a gloriously proportioned and beautifully furnished and finished room which wraps you up in its arms and invites you to relax. With a roaring fire on cold days there can be few better places in which to spend a quiet afternoon, though the intimate little snug bar a little further back in the house runs it close. Other public rooms include the Mither Tap Restaurant, another beautiful and comfortable room, while the orangery, the library and the billiard room are among the options available in the hotel for functions and private dining. It is no surprise to find that Macdonald Pittodrie House is an extremely popular wedding venue, and that it is seen as equally good for corporate away-days and other functions. Only one wedding is ever booked on a given day, and functions of between 16 and 150 can be accommodated (25-150 for weddings). The main ballroom is part of a self contained suite of rooms and can be accessed from its own car park at the rear of the hotel. As a result, for much of the time guests simply staying at the hotel can do so virtually unaware that a wedding is taking place elsewhere on the premises. There are 27 en-suite guest rooms at the Macdonald Pittodrie House Hotel. All have views of the surrounding estate and gardens, and some look up at Mither Tap. Ten rooms are graded as classic doubles, and two are classic twins. All come with everything you would expect from a four star hotel. The seven executive rooms are larger and include additional workspace. There are also eight feature rooms, one in the "new" (1989) part of the house, and the other seven in the original house. These add into the package a seating area and a lot more individual character, while some have feature beds and one has a circular bathroom. Two of the guest rooms are considered more accessible than the remainder, though the constraints of the building dictate that these are on the first floor and accessed via a flight of wide stairs. The ballroom end of the ground floor of the hotel is fairly accessible, while the older part of the building, perhaps inevitably, comes with slight changes of level in various places and some tight turns, but in practice has proved reasonably accessible. We expected great things of our stay at the Macdonald Pittodrie House Hotel, and found it lived up to our expectations. The setting is sublime and the building itself simply oozes the authentic charm and history of a Scottish castle which has led a long and eventful life. The public rooms are wonderful, and the quality of the service on offer from an excellent team is outstanding: all the more commendable as at the time of our visit a number of staff were new. This is one of those hotels you leave with a genuine sense of regret, and to which you hope to return before too long. You can read our dining review for Macdonald Pittodrie House here.